‘Unbelievable!’ No, it wasn’t Bert le Clos, father of South Africa’s Olympic swimming star Chad, who was beaming with joy after winning the Kempton Park leg of the Els for Autism series. 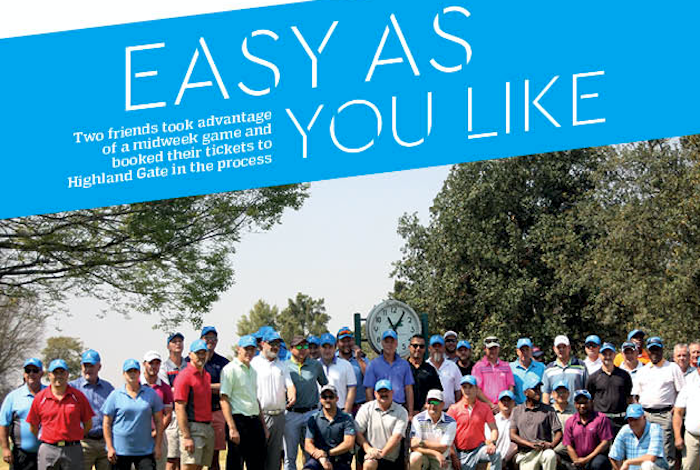 Rather, it was Martin Thirlwell, a then 14-handicapper from Umkomaas Golf Club. ‘I got cut instantly,’ said Thirlwell without any hint of sadness that usually follows a golfer trying to be competitive off his standard handicap. There was no sadness at all after coming out on top during a well-supported day at the par-72 parkland course. Thirlwell was a guest of his friend Mac Brauw, who joined his mate as a first-time player of the event. No longer a regular golfer, Brauw is a former junior and scratch league player after growing up on the Bryanston fairways, but clearly he has a lot of game left in him. ‘Work and family commitments, and other hobbies mean I don’t have that much time any more to play, but I certainly enjoy it when I do,’ he says. And who could argue after he fired a 78 to go with Thirlwell’s 81 as the pair ran away with the competition on 49 points? The secret to their success? The duo aren’t giving away too much. ‘We both played well,’ says Thirlwell. ‘And even though I struggled off the tee I managed to bring it back nicely with my irons. Winning was a bonus for Thirlwell, who was just pleased to cut out a run of some higher than usual scores. ‘It’s my first low-80s round in a long, long while and I guess it came at the right time,’ he said, still talking with the excitement of a golfer who is ready to make his first trip to Highland Gate. ‘I’ve heard so much about it, they say it’s a real hidden gem. My cousin has a house there, so I’ll be chatting to him to try to get some tips,’ says Thirlwell. Thirlwell is ready to test his mettle against the rest of the qualifiers, with a dream meeting with The Big Easy on the line. ‘It’s way too early to start thinking about winning the finals, but it would be incredible. I’m a huge fan of Ernie’s – always have been, always will be. I get goosebumps just thinking about getting the chance to spend time with a legend of South African sport,’ says Thirlwell. A trip to Highland Gate beckons, with only events in October left before the winners from around the country assemble in Dullstroom to compete for the ultimate prize.